Can you come up with the best- or worst-sounding reverb? The top half looks familiar - the bottom half less so. 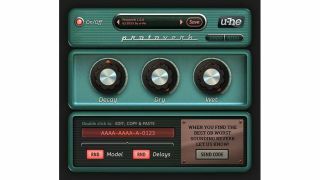 It's not often that a developer releases a plugin and admits that making it sound good is down to "trial and error, and maybe a lot of luck with random values," but that's precisely what u-he is saying about Protoverb, its latest freebie. This experimental reverb plugin is based on the idea of a "room simulator" - it builds up as many room resonances as possible, modelling the air in the room. However, while u-he says that the results can sound very natural, Protoverb's design is such that predicting what these will be is difficult. However, u-he appears to be making a feature of this unpredictability, giving you a text box at the bottom of the display that contains two random entries. You can enter values yourself by double-clicking, or simply hit the random buttons and see/hear what comes up. So, the release of Protoverb is actually a data mining concept - u-he wants the community to come up with good (and possibly terrible) settings and share them with others. The plugin is available in VST/AU/AAX formats for Mac, Windows and Linux and can be downloaded from the u-he website.